Data can be easily lost from an organisation, whether it be inadvertently through users’ poor awareness of data sensitivity, or malicious insider threats. 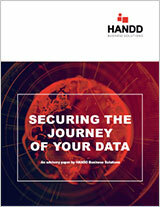 DLP solutions help to identify and shut down these threats before data loss can take place. 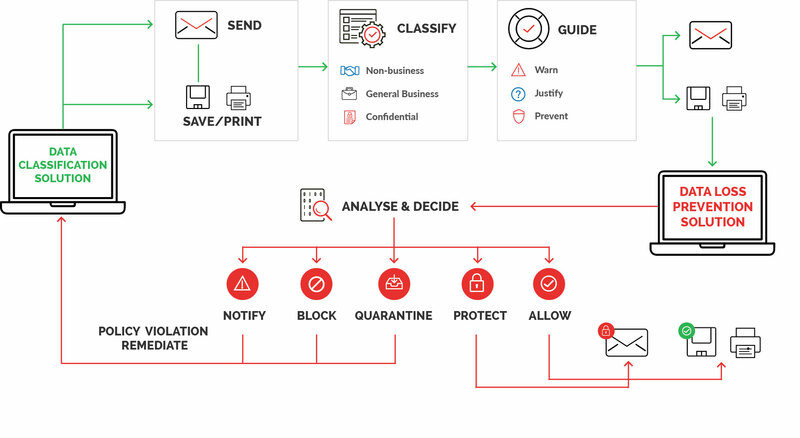 Add Data Classification into the mix and your DLP solution can be governed by a simpler set of rules and a quicker way of identifying sensitive data, making it more powerful and more consistent in the application of a strong and compliant data security strategy. DLP can work in conjunction with metadata applied through classification to reduce data loss even more efficiently. Using metadata, DLP solutions can closely monitor and manage data in accordance with your company policies so those with access permissions can and are the ones accessing the data. It can even prevent the most sensitive data from leaving your company without delaying the transfer of data that needs to be shared. DLP recognises that data loss happens through means other than email. Web filtering prevents highly sensitive data from being uploaded to the public Cloud on platforms such as Dropbox and Box, and DLP’s end point protection ensures sensitive data cannot be downloaded to other devices. Data Classification enhances users’ awareness of the value of data with visual stamps automatically added to headers, footers or as a watermark on documents, serving as a gentle reminder of the sensitivity level of that particular piece of data. With the use of meta descriptions, search time can be vastly reduced as metadata can be scanned for key words or terms, ensuring data sent is done so in line with your company policy, and making the day to day flow of communication faster and more efficient. By using metadata to provide contextual results, searches are more accurate and, because there’s less dependency on content alone, the frequency of false positives are reduced, so you no longer have to waste time sifting through reams of results to ensure you have the right ones. There is an increasing raft of legislation that is placing the onus of data responsibility back on the data handler as well as data producers to prove data is being handled correctly. With company data policies mapped to your DLP and deployed effectively using Data Classification, it is easier to demonstrate compliance upon demand.